Perennials, 20-70(-90+) cm. Aerial nodes proximal to first peduncle usually (5-)6-12+, distalmost 1-3 internodes 4-6(-10+) cm. Leaves: mostly cauline on proximal 2/3-7/8 of plant heights; petioles 2-10(-25+) mm; blades usually simple, rarely with 1-2(-3+) lateral lobes, simple blades or terminal lobes lance-elliptic to oblanceolate or lanceolate, 15-60(-80) × 2-25(-35) mm. Peduncles (7-)12-15+ cm. Calyculi of lanceolate to lance-linear bractlets 3-7 mm. Phyllaries lance-ovate to lanceolate, 5-8+ mm. Ray laminae yellow, 12-15+ mm. Disc corollas 4.6-5.4 mm, apices yellow. Cypselae 2.5-3 mm, wings ± spreading, ± chartaceous, entire. 2n = 26 (+ 0-2B). Flowering (Apr-)Jun-Aug(-Sep). Sandy soils, granite outcrops, open pine-oak woods, ditches and roadsides, other disturbed sites; 30-1000+ m; Ala., Ark., Conn., Fla., Ga., Ill., Kans., Ky., La., Mass., Miss., Mo., N.C., Okla., S.C., Tenn., Tex., Va., W.Va. Bushy to wiry, nearly glabrous plants with leaf blades mostly simple, mostly oblanceolate, and 2-15+ mm wide and with relatively small heads, florets, and fruits from coastal Mississippi and included here in Coreopsis pubescens may merit recognition as C. debilis Sherff or C. pubescens var. debilis. Clustered perennial 6-12 dm, leafy throughout, evidently pubescent with short, loosely spreading hairs, rarely glabrous, lvs relatively broad, mostly elliptic or ovate, short-petiolate, 4-10 נ(1-)1.5-4 cm, entire or very often with 1(2) pair of much smaller but similarly shaped pinnae at base; pappus commonly of 2 short, chaffy teeth; otherwise much like no. 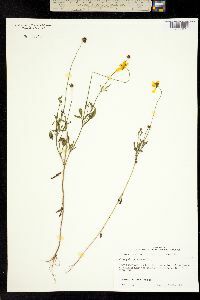 2 [Coreopsis grandiflora Hogg]; 2n=26, 28. Chiefly in woods, especially in sandy soil; Va. to s. Ill. and Okla., s. to Fla. and La. ; occasionally intr. elsewhere. June-Sept.